Starting a cold lawnmower engine requires that you prime the carburetor. 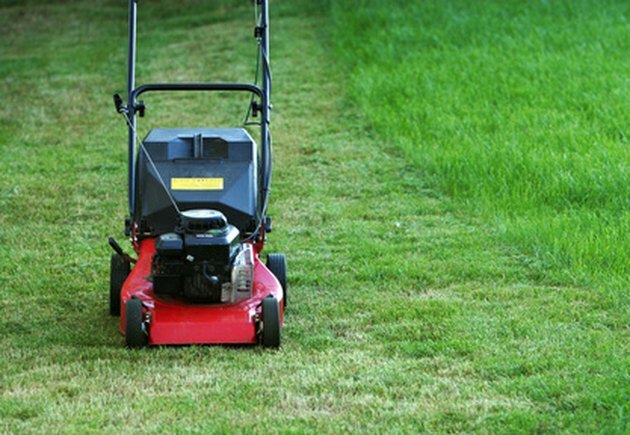 When a lawnmower sits for a period of time, the fuel in the carburetor evaporates. Priming is a way of putting some gas into the carburetor float bowl to start the lawnmower engine. Most lawnmowers have a soft plastic or rubber bulb to push gasoline into the carburetor. Priming a lawnmower carburetor is pretty much the same process no matter who manufactured the mower. Starting a cold lawnmower is easier if you first prime the carburetor. Remove the cap from the lawnmower fuel tank. Fill the tank with gasoline and replace the cap. Locate the primer bulb on the side of the lawnmower engine. The primer bulb is usually red and located under the carburetor. Press and release the primer bulb three times with your finger to prime the lawnmower carburetor. Pull the throttle lever on the lawnmower handle to the "fast" position. Grab the pull rope with one hand and pull it slowly until you feel resistance. Hold the throttle bar against the lawnmower handle with your other hand and pull sharply on the rope to start the engine.